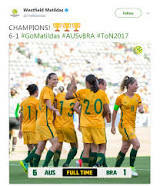 Citing surveys into the Matildas “workplace” by the players association the PFA, and the Our Watch organisation set up to counter mistreatment of women including domestic violence, the FFA on 19.1.19 suddenly sacked the team coach Alen Stajcic. That was not well managed, not transparent: the survey reports have not yet been made public; the coach had done well with the team in competition; as runners-up in the 2018 Asian Cup they were fast becoming the apple of Australians’ sporting eye as great improvers — working up to the World Cup in just five months’ time. Others are said to have dumped on “Staj” in the surveys, about them being put under “mental stress”, although as said, the survey reports have so far been withheld. Note to FFA: Let’s have the facts. Comments from all sides affirm he is not a sexual offender. What is he supposed to have done? “As we have seen in Australia across the past year particularly, Australian women’s sport is improving rapidly. This is partly the result of improved pay, tougher training regimens, demands for greater commitment and other raised standards. “At the same time, rightly, the field is now considered a workplace with players’ mental wellbeing, health and safety and other rights to be respected even as coaches scream at their players to run another lap or lift another weight. The answer seems to be to balance out both, highest standards and the most mature treatment – tricky even for the best of professionals. Likewise we have to tussle out which kinds of pressure: the out-there sports pressure of a meanie coach getting you motivated, making you train-and-train and go for it; or the more Byzantine kind, a different kind of “sport”, where off-field conflicts, half-explained sackings and knifings just might make the team forget to compete, go sick at heart. Something happened to the swimming team at the 2012 London Olympics, maybe to do with motivation, application, distraction, need for over-drive. Those who would recall watching successive teams striving at time trials over the years were left wondering. It looked like a lot of Facebook messages getting sent home instead of medals. They can get some inspiration from going over the records of Australians over the decades making a great mark in international sport across the board: plenty of cutting edge and science, work, more skills development, team spirit, green-and-gold, concentration – don’t forget character. Quiz: talking of leadership and character, name two Australian players in different sports, different time, identifiable as “AB”.